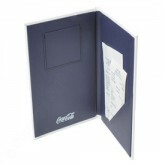 What goes with restaurant, nightclub or bar menus must be Guest Check Presenters. Our Guest Check Presenters come with large selection of multi-tier quality cover materials such as Linen Bookcloth, Leatherette, or Top Grain Leather. We produce custom guest check presenters, custom iphone guest check presenters too Click Here to inquire about our iPhone Guest Check Presenters, for your restaurant checks. With a large selection to give your customers a quality experience and memory to appreciate your services. Guest Check Presentors-25 Point Lexide “Quality"